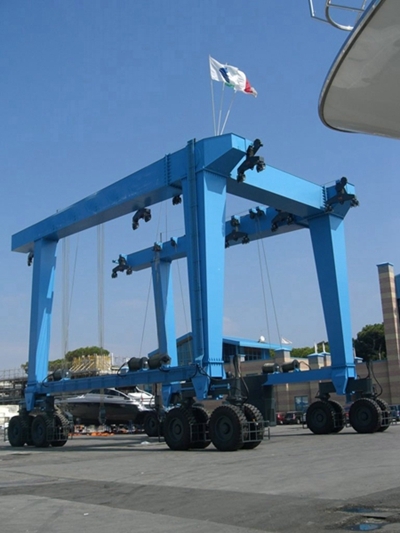 60 ton marine travel lift has wide application in different places, such as dock, shipyard, construction site, aquatic clubs, water sport meetings. 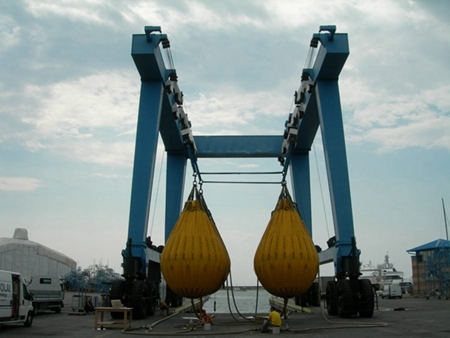 This kind of lifting device is great choice for boat lifting. 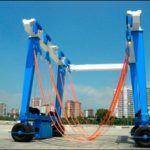 With soft and strong slings, the travel lift can lift heavy vessel without damage; with a number of tyres, the boat hoist crane can transport the boat from one place to another place flexibly and fast; with reasonable design, the hoist crane can lift the boat that is higher than the machine. According to lifting capacity, the travel lift has two types as light duty travel lift and heavy duty travel lift. Light duty boat hoist is suitable for small boats. It has lightweight, simple structure, compact system and flexible move. 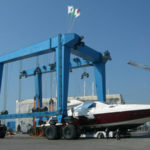 Heavy duty travel lift is perfect for large boats. It has complete safety protection devices, large loading capacity, stable performance and long service life. 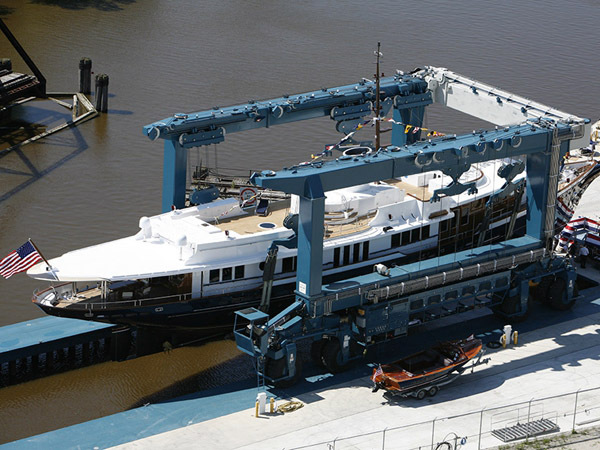 The travel lift drives onto the slip to an open-end pier to lift vessels from the water. Straps are secured around the boat prior to hoisting. 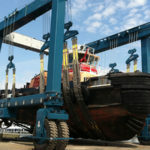 Once out of the water, the lift can drive the vessel to areas within the yard for upland storage or repair projects. 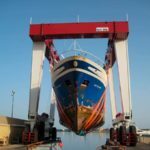 Marine travel lift boat hoist sling inspection and replacement guidelines are critical to the productivity of your machine and marina. By following the recommended inspection and maintenance procedures below, your marina will maximize its efficiency for the long haul and ensure that each pick is handled in the safest way possible. The inspections are not complex. It takes little time. If every operator can check the travel lift according to the requirements, the crane will has a long service life. 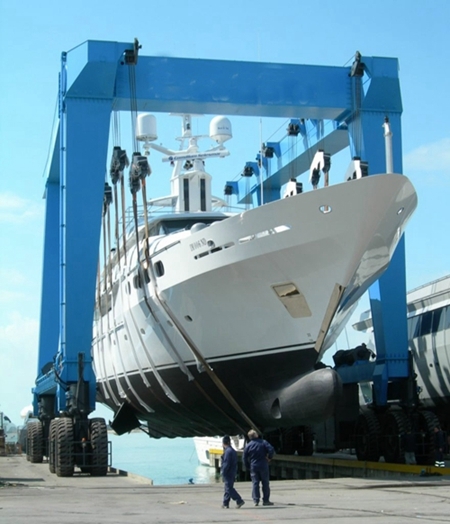 Before the first haul out of the day is made, and before every use, a sling and rigging inspection must be followed. 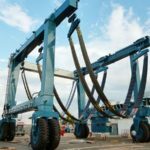 Slings and rigging must also be appropriately inspected before each lift is made during daily operations. All new, altered, modified, or repaired slings and rigging hardware must be inspected by a qualified person to verify their compliance with the applicable provisions of ASME B30 standards and inspections before being placed into service. Written, detailed sling and rigging inspection records should be kept for all slings. These records show a description of the new sling and its condition on each subsequent inspection. Experience gained on the service life of the similar gear used in similar applications. Compared with 600 ton travel lift, 60 ton travel lift is much smaller and lighter. 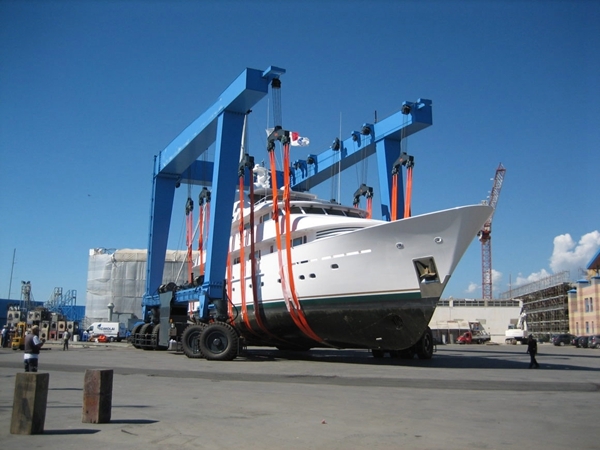 Thus 60 ton boat hoist crane can be used for tiny vessel. 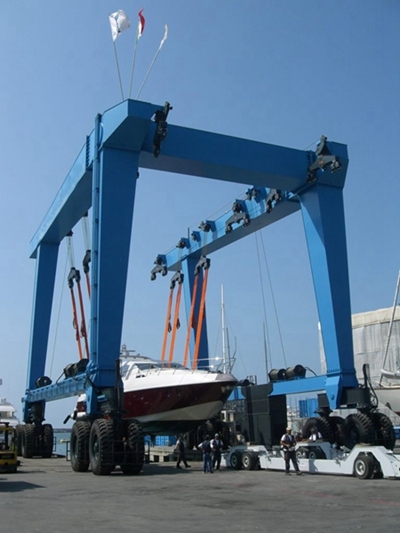 Small boat lift crane is much cheaper than large boat hoist crane. 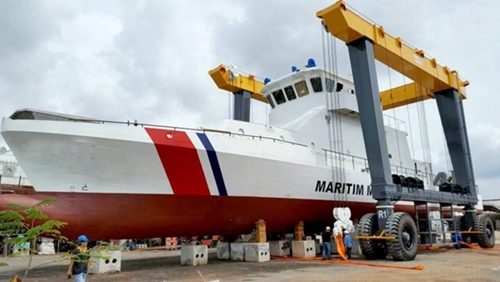 So if the boat is not heavy, just choose a small marine travel lift. 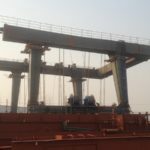 If your boat is very heavy and large, never hesitate to choose heavy marine travel lift, such as 500 ton hoist crane, 600 ton boat lift crane, 800 ton travel lift, 1000 ton marine travel lift. 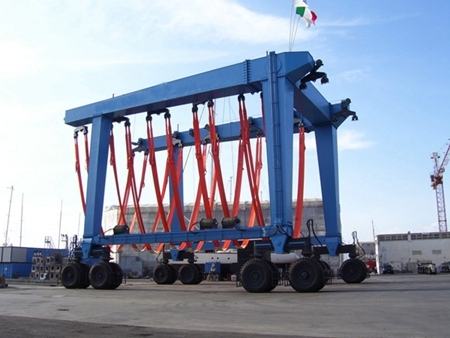 These large boat hoist cranes can make heavy lifting easier, faster and safer. They are equipped with reliable safety protection devices, such as anti-overload device, anti-over-speed, alarm system, rain-cover. 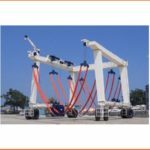 These devices can protect the operator and the crane from damage and ensure safety. Our company is a reliable and professional travel lift manufacturer in China. We provide types of marine travel lifts with factory price, such as electric mobile boat hoist, hydraulic mobile boat hoist, construction travel lift, dock travel lift, u shape travel lift, remote control travel lift, cabin control travel lift. All these cranes are available. For any question, just send email to sales@ellsentravellift.com. Every customer wants to get a good price travel lift, less cost, higher quality. Our company provides customized service. Such meticulous service can meet the customers’ need that purchasing a suitable travel lift with reasonable cost. Why can we provide travel lifts with factory price? We have powerful producing factory or cooperate with other large factories. Thus there is no middle factories between customers and our company, and customers don’t need to pay for extra cost. And this can save much expense for the customers.